What is R-Modawake (Armodafinil) used for? Armodafinil is often used by students and workers as a nootropic. It has improved memory retention, cognition and concentration. Armodafinil is an FDA approved treatment for excessive daytime sleepiness and is also used in cases of narcolepsy, sleep apnea and shift work sleep disorder. Armodafinil is a wakefullness-promoting agent (or eugeroic drug). It is the R-enantiomer of modafinil. How should I use R-Modawake (Armodafinil)? Armodafinil is usually taken at a dosage of 150mg or 250mg each day, however you may require some dosage adjustment to reach your ideal dosage. 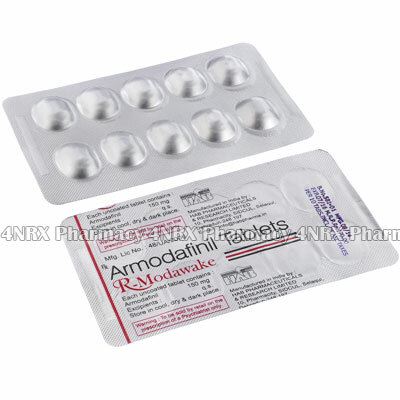 Armodafinil is a tablet form that you can swallow whole with a glass of water. If being used for excessive daytime sleepiness, narcolepsy or sleep apnea, armodafinil should be taken in the morning. If being taken as a nootropic or for shift-work sleep disorder, it should be taken approximately one hour prior to beginning your work. What are the side effects of R-Modawake (Armodafinil)? Armodafinil is contraindicated if in patients with a history of heart and/or heart valve problems. Armodafinil is contraindicate in patients with an yallergies to armodafinil, modafinil or any similar medicines.